The beautiful, protected beaches of Duck NC are maintained and respected by vacationers and locals alike. The pristine coastal landscape is the perfect backdrop for your Outer Banks vacation. As a matter of fact, the Travel Channel has named Duck, North Carolina as one of the "Top 15 Family-Friendly Beaches in North America." Vast streches of white sand, rolling waves, and sunny days await you and your family! Please note that there are no public beach accesses in Duck, North Carolina. Beach access is limited to vacationers, Duck residents, and invited guests. This policy allows for less crowded beaches and a peaceful beach experience. 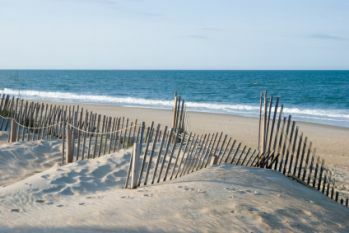 Read Sun Realty's complete list of Beach & Ocean Safety Guidelines before your Duck NC vacation. The most important rules are to use common sense and always keep a close eye on your kids. Duck NC Lifeguard Locations: Lifeguards are on duty from 10:00 a.m. to 6:00 p.m. between May 1 and October 31. Lifeguards also patrol Duck beaches on ATVs. Please note that this information is subject to change without notice. Search Sun Realty's wide selection of Duck NC vacation rentals to find the perfect home for your next Outer Banks vacation!